The Meadow yurt is in a large open meadow, bursting with a wide selection of wild meadow flowers in the spring and summer. It's a lovely space for a romantic getaway but is also perfect for a family getaway, comfortably sleeping 4 and with plenty of space for children to run freely and play in the meadow. Outside, there's a private outdoor wood-fired bath and private eco-loo/shower unit. There's also an outdoor fire / seating / cooking area, with options to cook over the wood fire. A hanging chair hung in the trees is the perfect finishing touch to this beautiful outdoor space. Inside, you have a hand-made double bed and two fold-out single futon beds, organic bed linen, sheepskins and simple but beautiful furniture. A two ring gas stove, cutlery, crockery and utensils are all provided for cooking. A beautiful hand-crafted wood burning stove will keep you warm and cosy (firewood and kindling provided) and the yurt is lit by tealights in lanterns. 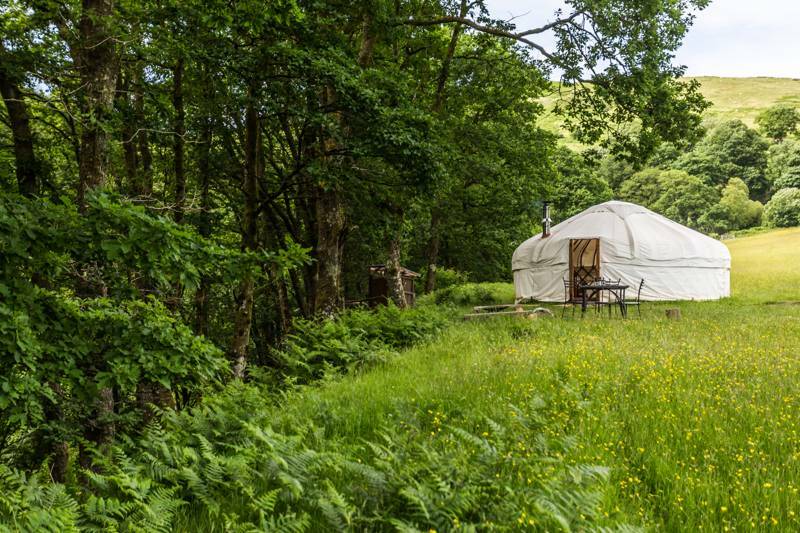 Remote off-grid retreats in the heart of the Dyfi forest. Authentic, back-to-nature forest retreat which rejuvenates weary bodies, minds and souls. 25 minutes off the tar road on a working organic farm, Eco Retreats offers a wifi free, eco-friendly retreat in the heart of Wales’ Dyfi forest. Our four beautiful yurts and one tipi secluded in a hidden valley offer a peace and quiet that’s hard to find in today’s busy world. Each living space is in its own secluded spot far away from other guests, complete with private bathroom and private outdoor wood-fired bath. Amazing walks with beautiful views, sparkling river with secret splash pools, ancient forest and a host of activities for the whole family within 30-60 minutes drive. Guests can completely unwind and reconnect with the wonders of nature, with each other and with themselves. Riverside teahouse area and conscious living centre offers the opportunity to savour an organic herbal tea as you read, journal or engage in inspirational discussions on all elements of eco-living! Each yurt/tipi is kitted out with everything you need, except food. A private outdoor wood-fired bath, eco-loo and spring mountain ‘shower’ with stunning views are on the doorstep. Pricing starts at £225 for a 2 night mid-week stay in a tipi or £279 for a 2 night weekend stay in a tipi. Yurts are £265–-275 for a 2 night mid-week stay and £319-329 for a 2 night weekend stay. Prices include bedding and all firewood. Eco Retreats is hidden in the heart of acres and acres of unspoilt forest. It’s a 4-mile journey on ‘forestry’ roads (which takes about an hour) off the A487. Directions are given on booking. The nearest train station is Machynlleth, from where it's a 20-minute taxi ride. Trains arrive in Machynlleth about every 2 hours via Birmingham, a taxi to the site takes about 20 minutes and costs about £20.